Robin Hood and his bow. Robin Hood's longbow was made of the finest English Yew, a wood noted not only for its strength and flexibility, but also for its medicinal, spiritual, and symbolic connotations. For more details about the Longbow and the bow Robin Hood probably used click on THIS LINK and THIS LINK. Top to Bottom: John Derek, Errol Flynn, Richard Greene, Richard Todd, Michael Praed, Kevin Costner, Robin Dunne. All versions of the Robin Hood story are reviewed on the Robin Hood website, and illustrated on the Robin Hood Pictures website. 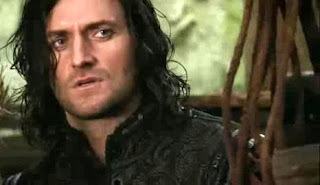 Above: Richard Armitage as Gisborne in the 2007 BBC series Robin Hood. 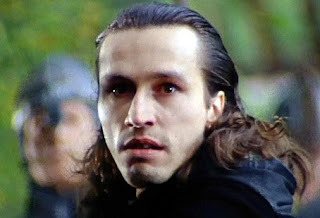 Below: Michael Wincott played the role in Robin Hood Prince of Thieves. In reality Guy of Gisborne was just a small incidental sentence or two in the life of Robin Hood, a stranger Robin encountered one day in the depths of Sherwood Forest and dressed from head to toe in animal hide. The stranger said he was out "hunting for Robin Hood", apparently hired in his task by the Sheriff of Nottingham. Robin didn't tell him his name but, curious to test the stranger's skills, proposed an archery contest. 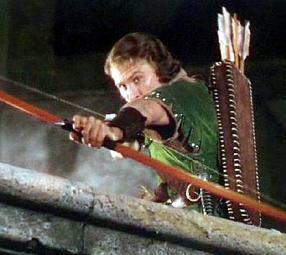 The stranger's ability on the bow was of an excellent standard but no match for Robin Hood. Having lost the contest the strange revealed his name was Guy of Gisborne. At that point Robin Hood revealed his own identity, and the two men swiftly drew swords. Robin was wounded in the side of his waist, but recovered his balance enough to kill Gisborne, after which he cut off his head and mounted it on his bow like a gruesome trophy. Then, wearing Gisborne's animal skin clothes as a disguise, he entered Nottingham Castle and rescued Little John from the Sheriff's dungeons. It was of course Hollywood that first elevated Guy of Gisborne's role in the legend, making him not only “Sir” Guy of Gisborne, but a rival to the Sheriff of Nottingham as Robin Hood's most powerful arch enemy. Basil Rathbone as Gisborne was a big factor in the success of The Adventures of Robin Hood (1938), and no doubt a major influence on the "camp" yet stylish manner in which Alan Wheatley would later play the Sheriff of Nottingham in the 1950's television series. But even Rathbone's wonderful performance pales alongside that of Robert Addie as Sir Guy of Gisborne in Robin of Sherwood (1984), where the character displays truly disturbing murderous tendencies. Guy of Gisborne / Gisburne / Gisbourne appears frequently in the website Robin Hood Pictures and Robin Hood. 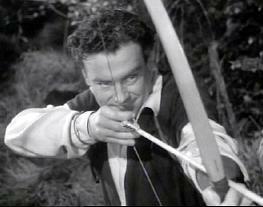 Above: Paul Dickey as Gisborne in the Douglas Fairbanks silent movie version of Robin Hood. In my opinion Dickey was the best thing about the movie. One of many innovative ideas in Robin of Sherwood was the introduction of a Saracen outlaw, Nasir, played by Mark Ryan (top picture). 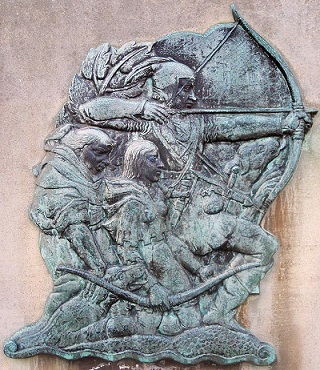 Traditionally (if not in truth) Robin Hood has been portrayed as a loyal supporter of King Richard the Lion heart Crusader. So the introduction of a Muslim outlaw, whose religious beliefs would clash with those of the English outlaws (especially Friar Tuck's), was a bold move but one which worked perfectly. Indeed Nasir was such a huge success that every subsequent interpretation of the Robin Hood legend has included a black/Saracen member of the Merry Men, such Morgan Freeman as Azeem (bottom picture) in Robin Prince of Thieves (one of the more successful elements of that film). Other actors who would continue this concept include Hakim Alston as Kemal (New Adventures of Robin Hood), and Anjali Jay as Djaq (BBC's Robin Hood 2006). Mark Ryan's Nasir has retained its cult status; a silent character wielding two swords, who puts Robin Hood himself to the test before joining the band of outlaws. See more Nasir pictures by clicking this link. Robin Hood and Maid Marian / Marion were the Romeo and Juliet of Old England. In The Adventures of Robin Hood Maid Marian (Olivia de Havilland) is at first very much on the side of the Normans until Robin Hood (Errol Flynn) took her into Sherwood Forest to see for herself the conditions under which the poor of England were suffering. It is said that in real life Olivia de Havilland found Errol Flynn's charms equally irresistible. The film Robin and Marian was based on the final days of the couple's lives. Robin Hood (Sean Connery) returns from the Crusades, a wiser but older man, to find himself the subject of many a ballad in praise of the days of his youthful escapades. Maid Marian (Audrey Hepburn) leaves the convent to renew their intimate romance, and try and soothe his restless spirit. Robin of Sherwood gave us a more youthful and realistic portrayal of the relationship. Here we see the dashing young couple on horseback, Robin Hood (Michael Praed) having rescued Maid Marion (Judi Trott) from the clutches of the evil sorcerer Baron de Belleme. See also: Robin Hood and Maid Marian's wedding, Robin and Marian's statue, the 1950's Robin Hood television series version of the relationship, and Maid Marion picture gallery. To see an aerial photograph of the church in which Robin and Marian were married click here. (Comments box has advice if not sure how to use). Robin Hood and Much the Miller's Son. Above: Sam Troughton as perhaps the most significant Much ever, in BBC's Robin Hood (2006). Below: Jack Wild made a strong impression as Much, albeit a very small appearance in Prince of Thieves. 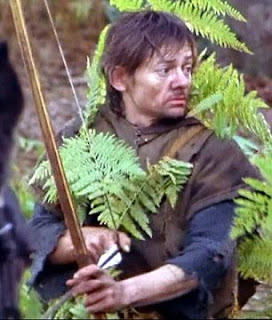 Much the Miller's Son is an inconsistent character within the legends of Robin Hood, but he is most commonly depicted as a young simple man who Robin Hood tries to save from being arrested for poaching the King's deer. Much's parents are persecuted as a consequence by the Sheriff's men, and Much flees to join Robin Hood's outlaws. 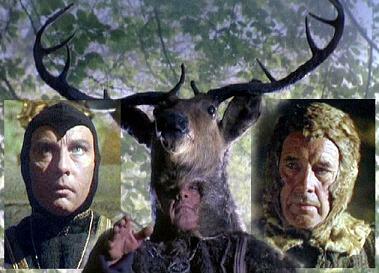 In The Adventures of Robin Hood, he is played by Herbert Mundin (top left), in Robin of Sherwood, by Peter Llewelln Williams (bottom left). But in all interpretations of the Robin Hood story he can be seen as a symbolic figure, a metaphor for all the poor oppressed commoners of England. Herne the Hunter, from "Robin of Sherwood". In Robin of Sherwood Herne the Hunter is the pagan priest from whom Robin receives guidance as to how to channel his skills and defend the oppressed people of England. This is a really refreshing change from the concept of Robin as defender of an absent Crusader King, and probably a lot closer the truth. According to legend Herne was originally employed to look after the Forest of Windsor where he was favoured by the King because of his great hunting and woodcraft skills. This led to much jealousy among the other hunters. One day Herne saved the King's life by stepping between him and a charging stag. He fell as if dead, but a dark figure appeared, calling himself Urswick, and telling the King that for a reward he would save Herne. The stranger then cut the head from the stag, bound it to Herne's head, and carried the body back to Herne's own hut. Upon his recovery the King made Herne the Chief Keeper of the Forest. However, the other jealeous foresters also did a deal with the strange Urswick, the result of which was that all Herne's great skills disappeared as if by magic. The King then fired Herne, who subsequently hung himself from an oak. But by night Herne's spirit would rise up and lead a band of great hunters through Windsor Forest, killing the King's deer. The only way Herne's ghost could be appeased was for the King to hang those foresters responsible for his demise, and this he did. But it is said Herne’s Spirit ruled the forest for eight years after the King's death, and may indeed be there to this day. 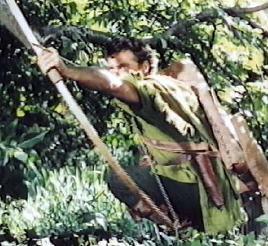 Above and right inset: John Abineri as Herne the Hunter in Robin of Sherwood. Left inset: Sorcerer Baron De Belleme played by Anthony Valentine, who plots to steal the source of Robin Hood's power and skill. For more about Robin Hood as the Green Man of Pagan beliefs see THIS LINK. The "darker", more mystical side of Robin Hood is also depicted on THIS LINK and THIS LINK. 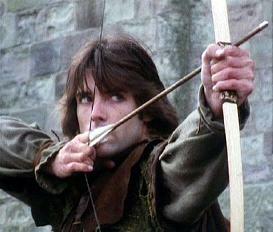 Robin of Sherwood (1984) is arguably the best interpretation of the Robin Hood legend. Filmed largely on location in the often damp forests of England, and using an authentically young cast with broad commoner accents, this television series juxtaposes a sense of realism with mystical pagan beliefs in witchcraft. In the opening episode Robin from Loxley tries to save Much the miller's son from being caught poaching. As a consequence he is thrown into the dungeon by Guy of Gisburne, where he meets Will Scarlet / Scattlock together with various other outlaws, and hears their stories of ill treatment at the hands of the ruling classes. Upon their escape Robin is sought out by Herne the Hunter, a pagan mystic who dwells in the forest with the knowledge that Robin is the "chosen one", the Man In the Hood, prophesied to appear and defend the rights of the people of England. Thus it is that Robin from Loxley becomes Robin in the Hood. So this Robin Hood has no thoughts of loyalty to absent Crusading Kings. His opinions are expressed clearly to the rest of the outlaws: England is being bled dry by foreign wars, and the proletariat have no-one to fight their cause. The evident sub text here being that the Christian religions of the land-owning Lords have subdued them, but the pagan spirits of the forest can set them free. Robin of Sherwood combines in equal measure excitement, romance, and mysticism. Michael Praed as Robin Hood, and Judi Trott as Maid Marion are both excellent in their roles, but it is the villains of the piece which steal the show. The Ray Winstone portrayal of Will Scarlett is genuinely scarey, his mind half deranged by memories of how his wife was tortured and killed. 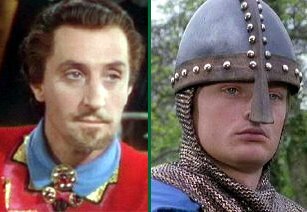 Robert Addie as Guy of Gisburne is even more psychopathic in his tendencies, restoring the status of the role to that of the 1938 version; whilst Nickolas Grace as the Sheriff of Nottingham strives to match him in equally ruthless measure. Indeed, this is the first Robin Hood adaptation to enjoy both an evil Sheriff and Gisburne, and if that isn't enough then various other Sorcerers and Witches appear along the way to steal the source of the Man in the Hood's power. 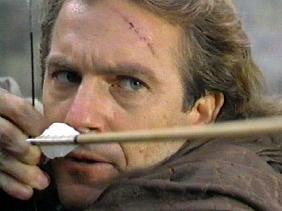 Two other notable points about the series: Robin of Sherwood was the first version of the legend to introduce an Arabic outlaw to Robin's Merry Men. Nasir (Mark Ryan) was such a success the idea was "borrowed" for the later Robin Prince of Thieves, and there can be little doubt that Winstone's Will Scarlett was equally influential. Also, Clannad's enchanting electro-folk soundtrack not only enhanced the mystical quality of the story line, it added greatly to the perception that this was a renewal of the legend; a story not just intended for children, but one which harboured still contemporary adult themes. Little wonder then, that over twenty years since first broadcast, Robin of Sherwood continues to spawn websites and fan clubs across the globe. No other adaptation of the story of Robin Hood and his Merry Men of Sherwood Forest can make such a claim. (See comments box for more cast details). Robin Hood, the Sheriff of Nottingham & Guy of Gisborne : Duels to the Death. Top: Robin Hood, Marian, and Tuck fight off an attack from Gisborne. Wall plaque, Nottingham Castle. Left: Robin Hood (Errol Flynn) clashes swords with Guy of Gisborne (Basil Rathbone) in a sequence which would elevate Gisborne's status as a villian in the legend far higher than any of the original ballads or tales ever did. 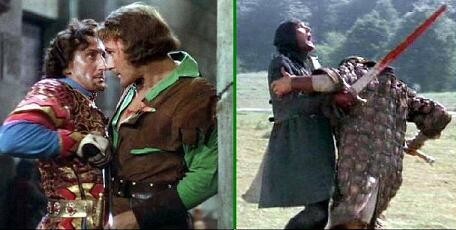 Right: Robin Hood's true enemy the Sheriff of Nottingham (Robert Shaw) in gory and gruelling battle against Robin (Sean Connery). For more pictures of their battles click here. Richard the Lionheart : Hero or Tyrant? 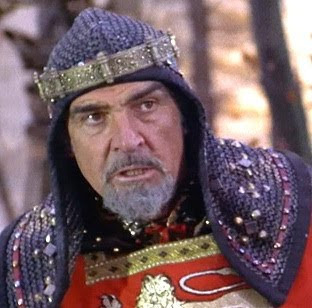 Above: Sean Connery as King Richard in Prince of Thieves. 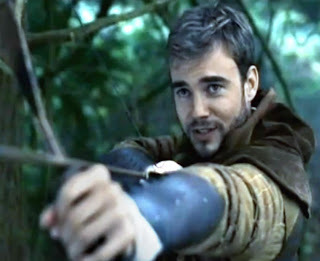 Connery has played the parts of both Robin Hood and the "absent King". History depicts a far different view of King Richard than Robin Hood himself ever did. Robin Hood was Richard's loyal supporter, and would remain so until his death. In the excellent film Robin and Marian we even see Robin join his King on the Crusades, only to become sickened and disgusted with the carnage he witnesses there. But Richard was his King, and Robin could never contemplate desertion. Here we see Robin Hood and King Richard in two entirely different interpretations. Left: The Heroic Crusader who rewards Robin for his loyalty and even judicates over his marriage to Marion. 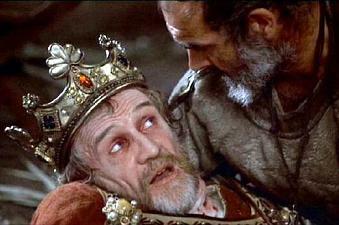 Right: The tyrant "Absent King", dying in the arms of outlaw Robin, the man he ordered executed for daring to question the King's bloodthirsty methods. In reality Richard only spent six months of his reign in England, and both the Crusades and the ransom which had to be paid when he was kidnapped, bankrupted the country. To see where the Crusaders gathered in the Midlands, Nottingham, before leaving for the Holy Wars see THIS LINK.